Randy has been in his new job for over six months now. In that time, I can count on two hands the number of times he has traveled for work. Maybe even one hand. That is huge for our family. Before he left Microsoft, he was sometimes gone three weeks of the month. The boys thought it was strange when he was here during the week. He was exhausted, I was exhausted. It was a life that was not sustainable and the travel is one of the reasons he changed jobs. Now, when it is time for him to fly out, he can’t remember where the business suitcase is. He has to look hard for his passport. It takes him more than ten minutes to pack because he is out of practice. The boys get confused as to why he is not here for dinner. It is all so much better. I don’t mind a business trip here and there – it gives us a little break from each other and a chance to miss one another. Last week, before Randy left town, I decided to make his favorite kind of food. I figured it would be nice to give him a good send-off and I was ready to try a new Enchilada recipe. I have a favorite but we had some sun last week and mushrooms didn’t feel very summery. As with that one, this recipe gives you a filling but not heavy dinner – one that just begs for refried beans, lots of guacamole, and cerveza. Combine the tomato purée, heavy cream, cilantro, garlic, salt, and pepper. Set aside. Preheat the oven to 350ºF. Place a sauté pan over medium heat. Pour in just enough canola oil to coat the bottom of the pan, then add the onion. Sauté until just beginning to soften, about 5 minutes, then add the zucchini, corn, and dried herbs. Cook until tender but not mushy, about 7 minutes. It’s ok if the zucchini gets a little brown. Remove the pan from the heat and stir in the chiles, beans, cilantro, and salt and pepper to taste. Allow to cool slightly. 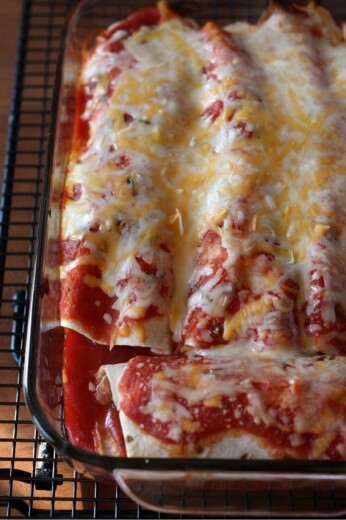 To assemble the enchiladas, pour a layer of sauce over the bottom of a large casserole dish (or 2 smaller ones). Spoon one eighth of the bean mixture along the center of a tortilla, then roll the enchilada up. Place seam side down in the baking dish and repeat with the remaining tortillas. 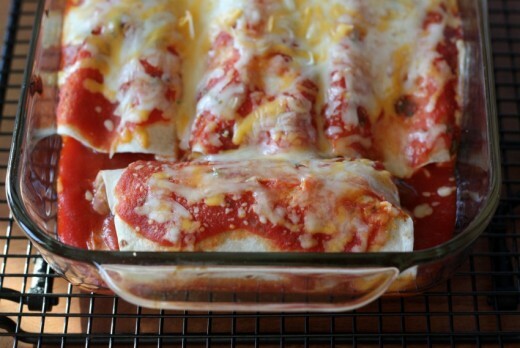 Spoon the remaining sauce over all the enchiladas, and sprinkle the cheese over top. Cover with foil and bake for 20 minutes. Remove the foil and bake for another 5 minutes. Allow to sit for 5-10 minutes before serving. this is the way, the easy way, for me to get my hubby to eat veggies. wrap it up, smother in cheese and sauce. bad i know. but it works. so, yep i love this. and it’s easy. Mmmm yum! What a great way to use all the zucchini this time of year. Wow time really has flown, since the last time I saw you, Randy was just about going to leave his old job. Crazy. I’m certainly glad things seem to be working out! this seems like the ultimate good-bye meal. Nice to meet you at the book launch tonight! What a great event. There should be one of these monthly! I’m so glad the job is working out well for everybody! Love this! I made enchiladas last week with a black bean, cottage cheese, zucchini, & spinach filling…turned out better than anticipated! These look very yummy, indeed! hey Dana- looks like there is kale in there?? what’s the leafy green… didn’t see it on the recipe. Looks great either way! Yum, looks great. Will put on the menu for next week for sure! 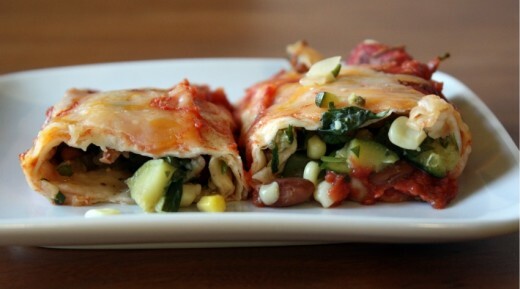 This looks quick and delicious – my kind of weeknight meal! I’m glad you rarely have to make your hubby a going away dinner these days! Just what I was in the mood for! I’ll be making these some time this week for dinner. They look great! Catherine, I added about 1/4 cup of chopped cilantro which I neglected to mention in the ingredients. I will amend – thanks for catching that! Those look fabulous. Are those the same ones you make for your Mexican class? I want enchiladas now! Yum. These look perfect for a summer supper – hopefully whatever is chewing on our zucchini in the garden leaves us some to make these. Just whipped these up for dinner tonight and they were fantastic. We are quasi vegetarians (meat graces our table 3-4 times a month), and your delicious recipes always inspire! These sound really good! 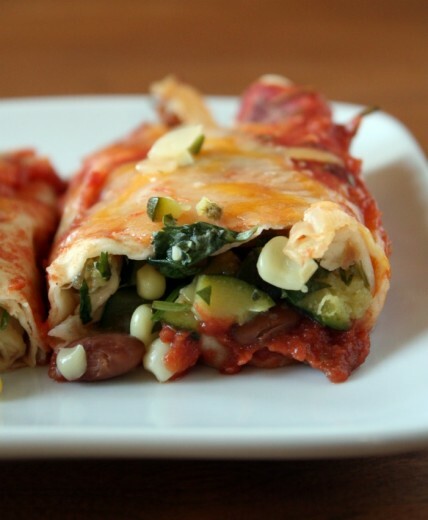 I’ve been looking for a go to enchilada recipe.